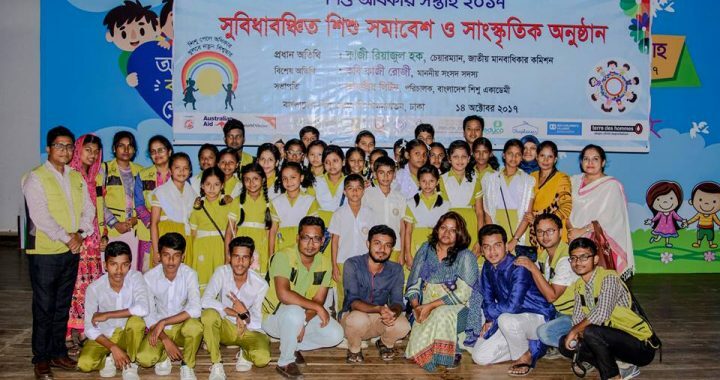 “Ensuring child right, opportunities may open worldwide” with this theme, this year 11-17 October has been declared as the “child week” by the Government of Bangladesh. In the 4th day of National Child Day, Bangladesh Child rights coordinate adeliberation where honorableMP Poet Kaji Roji was the chief guest and Australian Aid, World Vision Bangladesh, CSID, Surovi, Shapla Bangladesh, NariMoitri, ManusherJonno Foundation, Educore and Good Neighbors Bangladesh’s country Director Mr. JeoungSek Kim was presented to ornament the program. In a Speech, GNB’s CDinvited all to work together toensure Child Right throughout Bangladesh.